This is a shawl I started in my 30s and now I've finally finished it in my 50s! 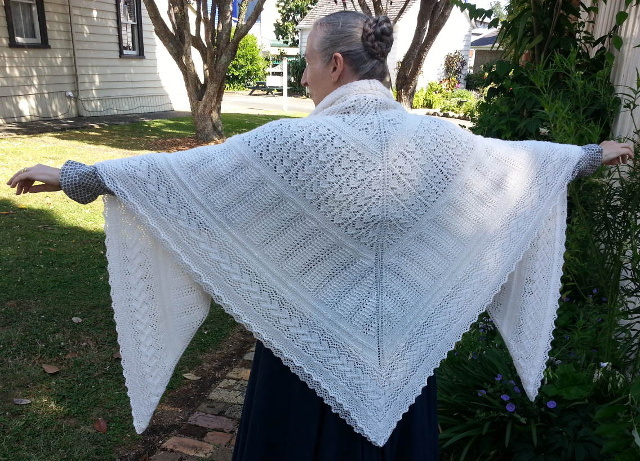 If you're curious, this shawl has 224,680 stitches and blocked up to be a 1.8 metre square. It was made with Shepherd machine washable 2-ply baby wool on 2.75mm needles. All joins are spliced so it is one continuous thread from beginning to end. It has an Emily Ocker's beginning and no casting off. Any shawl that has taken 14 years from start to (finally) finished ought to have a long story to tell, and this one does. So settle in for the longest-read you'll find on my web site. I like to knit shawls, I don't need any special reason to make one except that I feel like making one. So I decided I'd like to do a square shawl starting from the centre using some traditional Shetland lace patterns. I also wanted to include a band of Snowdrop Lace because that is the very first lace stitch pattern I learned when I was nine or ten. I had been collecting a series of weekly magazines called "Fashion Maker" that came out in the early-mid 1970s. 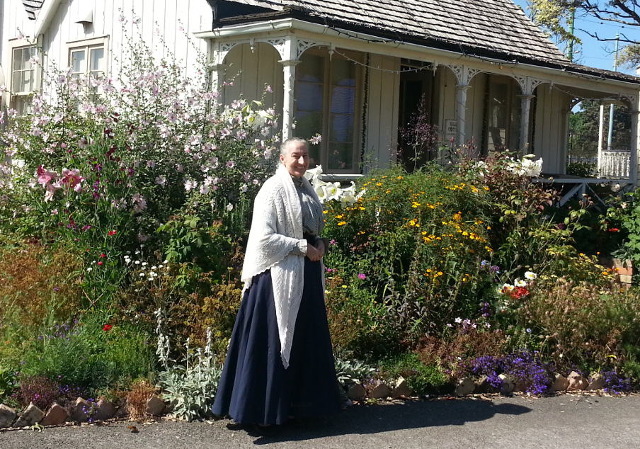 I looked forward to them every week and one week I read about wedding ring shawls. 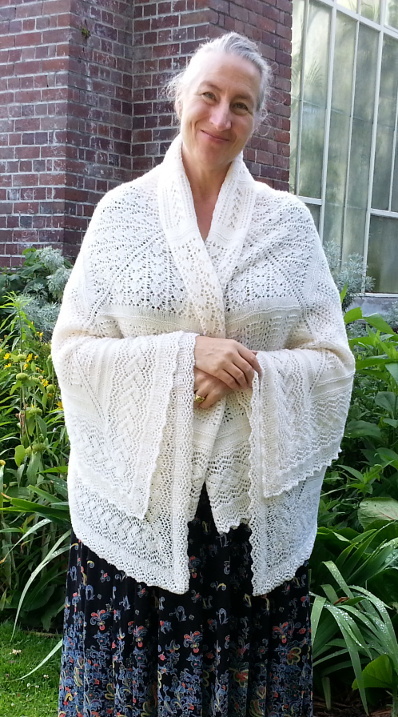 Over time I learned quite a few lace patterns from that series and the first one I tried was Snowdrop Lace - I was immediately, permanently hooked on lace knitting. At first I thought I might give this to a baby when it was finished because it would be a beautiful baby shawl - good enough I thought for a christening, baptism or naming ceremony. However I finished it on Christmas Eve, unpinned it on Christmas morning, put it round my shoulders and gave it to myself for Christmas! Shawl mitre detail during blocking. Roughly 30cm (1') on a side showing. Speaking of "Fashion Maker" - I never collected the whole series and there was a lovely lacy white knitted baby's layette in three separate instalments that used the Snowdrop Lace pattern. I got one of them (now lost) but not the rest. I'd dearly love to have all three issues and before updating this page had a plea to anyone who had the missing issues, or even the whole set. Thanks to a new friend I've found in South Africa through the internet I now own the entire set, all in binders, and it even has an index! Thank you so much, Anthea, I have spent many happy hours tripping down memory lane and discovering everything I'd missed out on the first time around. Right, back to the shawl... It took ages to knit because I got distracted with other things (like studying for a degree and starting a new career and then starting another degree, not to mention all the other things you see on my web site that happened after 2001) and would only pick it up sometimes. By the time I got towards the end and ran out of wool that dye lot had long since vanished off all the shelves everywhere in the country. I couldn't find it anywhere but I searched long and hard. With nothing to lose I tried one of the nationwide wool shops and asked if they could help. They put my plea in their newsletter and much to our surprise and delight someone did still have some in their stash and was able to supply me with two balls. I finally got the shawl finished, washed it, blocked it and considered it done. But was I happy with that enormous stroke of luck being able to get the wool to finish it after all? Oh no. 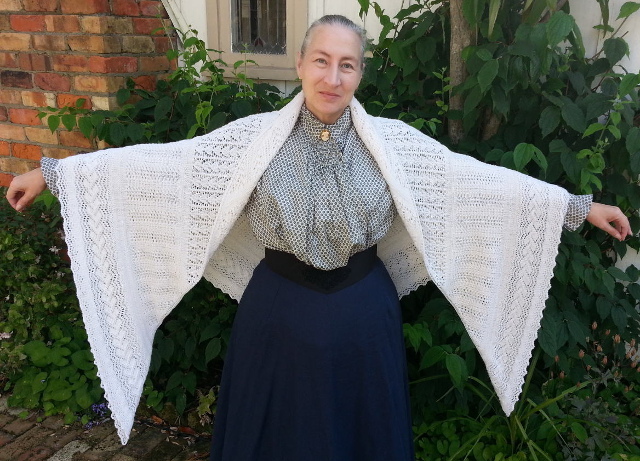 I had gathered the border as I joined it round the corners of the shawl and discovered I didn't like the curved corners on such a square shawl. To top it off I'd spent so many years making it that my tension had changed and the holes were so different in size on either side of where I joined the beginning of the border to the end that I just couldn't live with it. The border had 80,400 stitches and I undid every single one of them using my ball-winder. Fast? Oh yes, like lightning! My husband recorded this and said that one day he might see if he can play it backwards so that it looks like the ball-winder is knitting a border onto the shawl. I'd love to see that. So I started again, being more careful about the tension this time. This was no easy task because, of course, despite my attempt to steam the huge ball of frogged border (still attached to the shawl, remember) it was all rather crinkly having been knit, washed and blocked! I had no pattern for a mitred corner for the border so I spent a long time making lots of samples of various mitred corner variations, using various techniques for the short rows and charting them all carefully as I went so that when I found one I liked I'd remember how I made it. Finally I settled on one I really like and it's the one you see on the shawl now. While I'm not publishing the chart for the whole shawl (it's just a square with bands of mostly traditional patterns, after all) I thought it worth publishing the chart for my mitred corner. I'm happy to report that this time I really, really love the finished shawl. It was totally worth the long, long journey... After all, on average, it was only about 60 stitches a day! I'd like to share some tips I've picked up along the way (that is, things I found out the hard way). I found it was very easy for the needles to slip out of my short rows and recovering them in lace pattern takes so long it can be faster to rip back and knit them again. After that experience the first time when I was ready to start the mitre I put in a safety line with a piece of smooth, contrasting thread. When I was ready to start turning the corner (that is, each row started getting longer again) I put in a safety line all through the German Short Row "double stitches" as well as the last row of knitting. This also helped me to make sure that I used both legs of the double-stitches each time I came to use them on each succeeding longer row. After I'd finished the mitre I put in another safety line before I continued with the next straight part of the border. If you want to graft the end of the border to the beginning and attach the border to live stitches on the main piece as you knit it in one continuous piece (which is what I did, each repeat of the border "cast off" 6 stitches of the shawl) then decide what you want to be the first row you will work in the yarn still attached to your project and plan for this to be a wrong-side row of the border pattern. In another yarn work up to 2 rows before that row, then with another yarn work the final right-side row in a separate piece of strongly-contrasting yarn that will be easy to pull out when you finish. This is the first of your two guide threads and marks where you will graft the end of your border to the beginning. 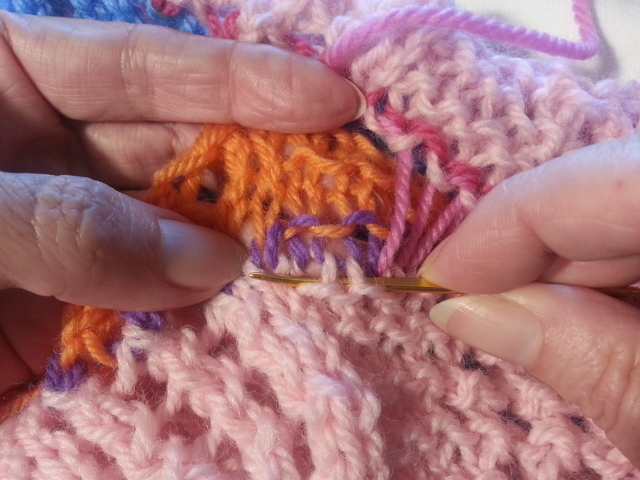 Make a note that you keep with the project that tells you exactly which row of the pattern this is. It's good insurance just in case you get interrupted making your shawl like I did. Continue with the next row and the rest of the border using the main yarn attached to the project. After you've done a couple of repeats take a clear picture if you can of both sides to show that single row guide thread between the "scrap start" and the "main yarn". It's a handy reference and you might as well have a picture of it with your project that you can put with your note about which row of the pattern it was. If you have a chart, mark your graft row on the chart for later reference too. The last row of the border that you will work with your main yarn will be the preceding wrong-side row in the pattern sequence to your first guide yarn row and then you will work the final right-side row in another separate piece of yarn of yet another strongly-contrasting colour that will be easy to pull out when you finish. This is your second guide thread and shows the exact path that your graft will take to join to the end of the border to the beginning. The two guide threads do the same pattern row but are different colours. Do a few more rows in pattern in another contrasting scrap thread and cast off. As an example of this whole process, let's say that the first main colour row you work with the project yarn is planned to be Row 12 of the pattern. Cast on enough stitches with scrap yarn to do rows, say, 7-10 and when you get to Row 11 do that in another strongly-contrasting colour. Here blue is the scrap start, deep pink is the first guide row & light pink is the main project yarn. Now you are ready to graft the beginning to the end. Have plenty of time with no interruptions, good light, a very blunt wool needle and magnification as well if you can get it. A contrast cloth underneath is helpful too - anything to help you clearly see every stitch and how it connects to its neighbours. 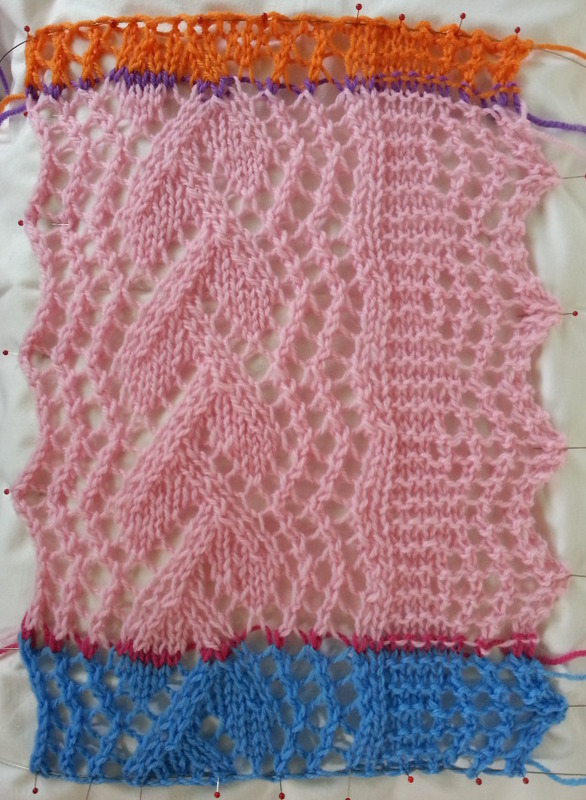 You'll want to be able to concentrate because grafting in lace pattern is not super-simple but it can be done, it gets easier with practice and it is worth it. You can now use a rather long tail from the outside edge of your main project - say 6 times the width of the border - to graft the end of the border to the beginning. Graft l-o-o-s-e-l-y so that it is easy for you to tell now and after you remove the guide threads which is your grafting row. Follow the paths made for you by each of your guide threads to show you exactly which path to take on each side to replicate the lace pattern row you are grafting. At the end your tail ends up on the inside edge of the border where it is easier to weave it in than on the outside edge. Here, to graft the end to the beginning I follow with the needle the path that the TOP of the deep pink guide thread's stitches takes through the main yarn. 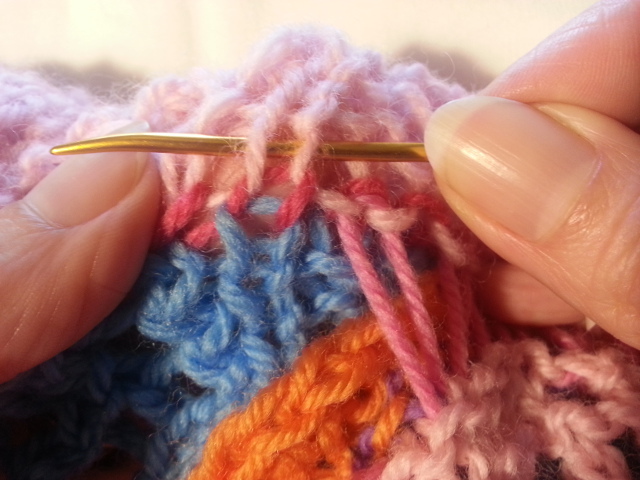 As soon as that guide yarn travels into the blue scrap yarn I swap to the other side of the graft. I made a mistake here that I had to take back after checking and correct - can you spot it? Keep looking until you find it, you'll need to spot any similar errors in your own grafting so you might as well learn first from mine. On the other side I graft the beginning to the end by following with the needle the path that the BOTTOM of the purple guide thread's stitches takes through the main yarn. 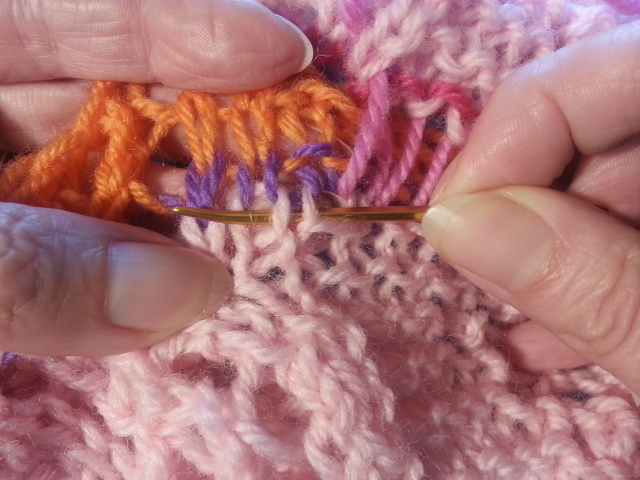 As soon as that guide yarn travels into the orange I swap to the other side of the graft. 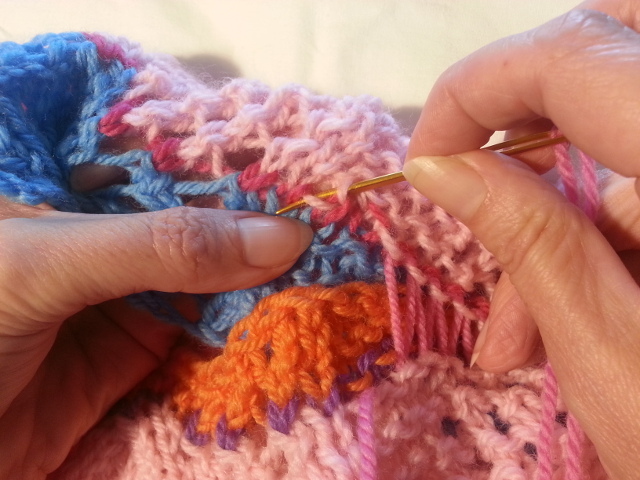 I keep repeating that process all the way from the outside edge of the border to the middle. I always follow the EXACT path that the guide yarns take to ensure that all yarn overs, decreases, changes from garter stitch to stocking stitch and so on are replicated exactly. Carefully inspect your graft on both sides. If you've made a mistake remove the graft to that point and try again. As long as your guide threads are still in, you're safe and can correct any error in your grafting without risking anything in your knitting. ONLY when you're quite sure, having inspected both sides, that you've followed exactly the right path, gone through every stitch on both sides of the graft and have not split any of the wool anywhere, remove the guide threads and adjust the tension in each stitch of the graft starting from the outside edge. Now you will be glad you grafted loosely - if you had not it could be very hard to figure out which row's tension to adjust. Here you can see my completed graft - done in a contrast colour so that you can see the lace pattern has been replicated - right down to the SSSK and changes from stocking stitch to garter stitch - and the border pattern is continuous. I "unvented" the basics of this method many years ago when I was grafting a lot of lace and have seen a similar version of it since called a "chimney top" for grafting the toes of socks. However, I never used the single rows of yet another contrasting thread before and only thought of it while I was grafting the border of my shawl. "Oh why on Earth," I chided myself, "didn't you use highly contrasting colours - that are different - for your guide threads?". 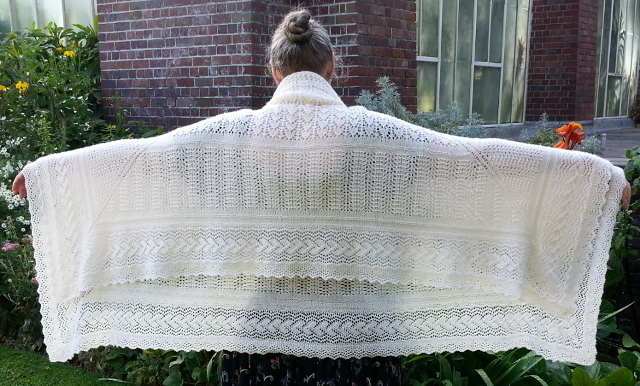 I had used pale lemon on the shawl for the scrap start and end and no contrasting guidelines - against white! I don't know if you've noticed but when pale lemon and white are knitted together they're very hard to tell apart under artificial light. Why not do a swatch in thicker wool like I did above to practice the technique before you try it on your project? With bigger stitches it will be easier to see how it works and you'll feel much more confident when you do it "for real". Naturally this method will work for grafting any pattern at all (lace, cables, nupps etc) provided the beginning and end are worked in the same direction. For head-to-head or tail-to-tail grafting there's no way to avoid a half-stitch misalignment. This method is still useful to help you get the best graft possible for those situations, but you won't get complete perfection. After blocking this shawl and spending most of the evening to do it, I'll do it a different way next time. I recommend that for the very first time you block a large or intricate piece you get an approximate idea what dimensions it will block to by laying it down damp and pinning it out with a mind only to the approximate shape - that is, the right shape but don't worry too much if the corners aren't at exactly the right angles or the curve of an arc isn't quite right. Have it damp for this because it will grow a lot compared to what it blocks to dry - trying to do an approximate block with dry knitting is a waste of time. Now measure it and put the shawl in something to keep it damp (dampening it some more if needed) while you take your time marking out and measuring the exact shape and size you want for the shawl, with all the corners at the correct angles and so on. Then place all the pins at an outward angle all around the perimeter of the shape. Stop and have plenty of breaks while you're at it too! And a cup of tea won't hurt. Next put the still-damp shawl on wires (except for the corner points) and hook the wires over the pins for one part, then the opposite side, choose another part to work and then do the opposite side until you have all the wires in place. Pin the corner points with their own pins last. Then do all the smooshing and spreading and point-spacing on the wires. Chances are pretty good the centre has centred itself automatically. If it hasn't then check with a tape measure and re-smoosh until it's in the right place. This is so much faster than pinning-as-you-go that your shawl probably won't dry out while you're still trying to block it. If it does just dampen it (spray with a fine mist and let it soak into the fibres for a few minutes or press gently with very damp towels). Leave the shawl to dry completely - utterly completely - and while you're waiting make a sketch of your final, perfected "blocking plan" with notes about how far apart you had to space your pins, how many pins you needed, which blocking wires you used (and how many of them) etc so that you know it in advance for next time you wash the shawl. Then next time you can skip the "approximation" step and set the whole pre-pinned shape up up before you even wash the shawl. 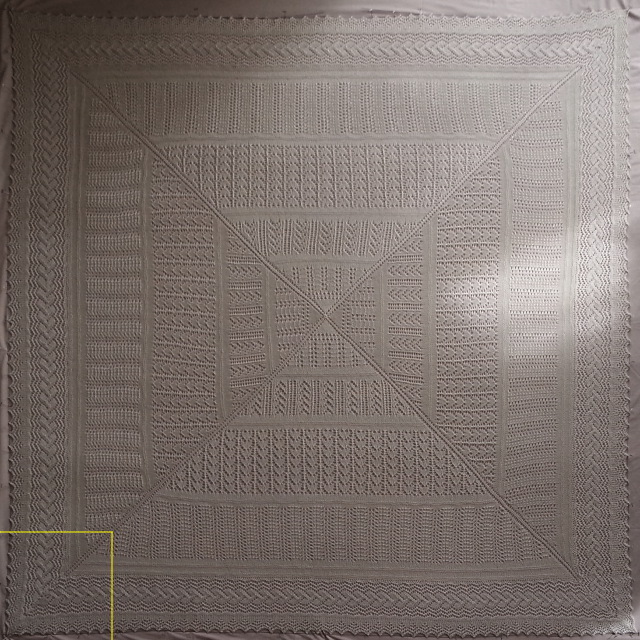 The blocked shawl above with corner detail below. Completed size 1.8m (70") square. Blocking in the evening is a good thing because my shawl was dry the next morning and most definitely dried "in the shade" even though I had to do it on my lounge floor that usually gets sun most of the day. This shawl took so long to finish that by the time I finished the border the second time a good deal of that border wool had only been out in the elements for a few weeks, but the main shawl had been out in the open for years - the more central part for many years. Towards the end the border was quite "white" against a very cream shawl so when I grafted the end to the beginning it was such a difference you'd never have believed they were same dye lot. After treating the entire shawl it is now very difficult to tell. In fact, I can't tell in most light. I thought you might like to know how I did it. First, a WARNING: Whatever you do, don't be tempted to go anywhere near household bleach for lightening wool. It can be done (research reductive and oxidative bleaching processes for wool if you're curious) but you have to really know what you're doing, know exactly what acid treatment to apply before and after, know the exact temperatures to use, and for how long and so on. If you're one of those people, you already know all this. :-D For the rest of us, if you try using household bleach and you get it wrong then you can turn your wool into goop - literally. Try putting a few centimetres of pure wool yarn into a glass of neat bleach straight from the bottle and observe what happens. Go on, if you haven't before, it's interesting! I've only ever tried the method below on pure WOOL - I have no idea how it works on other fibres so if you want to try it on something else, run an experiment on a throw-away swatch, take notes (and maybe some before, during and after pictures) and please report your findings if anything unexpected or alarming happens. What you'll need: A plastic bucket, rubber gloves, old clothes, measuring jug and spoons, lukewarm water, 6% w/v hydrogen peroxide, white vinegar, wool wash. Step 1: Put on some old clothes that you don't mind getting "lightened" as well and have some rubber gloves handy. Step 2: In a very clean plastic bucket measure how much luke-warm water it takes to completely immerse the article and have it sopping wet. Discard the water and gently squeeze as much water from the article as you can. Step 4: Immerse your article and gently squeeze the solution through it so that you can be sure it soaks evenly. If necessary weight it down so the article stays submersed. Step 5: After a couple of hours, turn the article over in the bucket, squeeze the solution gently through the article a little more and leave soaking for a another couple of hours. Step 6: Drain off the solution and squeeze as much from the article as you can. Rinse it in lukewarm water for a couple of minutes and squeeze it out again as much as you can. Step 7: Rinse out your bucket and fill it again with the same amount of lukewarm water as before and mix in 10ml of white vinegar for every litre of water. Step 8: Immerse your article, gently squeeze the solution through it. Leave it to soak for 5 to 10 minutes. Step 9: Repeat Step 6. Step 10: Handwash in your normal way using a proper wool wash, rinse if required, and gently squeeze out as much water as you can. Step 11: Put the article, if you can, in something like a zippered pillow protector or a clean pillowcase so that it is supported while you put it through a spin cycle in your washing machine. If you can't have it supported like this then roll it in a couple of really thick bath towels and gently stand on it all to get out as much sopping water as you can while still leaving it damp. Step 12: Block and dry. It will get lighter as it dries so don't judge the colour until it is dry. This whole treatment is safe to repeat. I didn't think anyone would be interested in the centre part of the shawl but I have received quite a few emails about it. So if you're interested "from the inside out" this should help, particularly if you want to make one of your own. 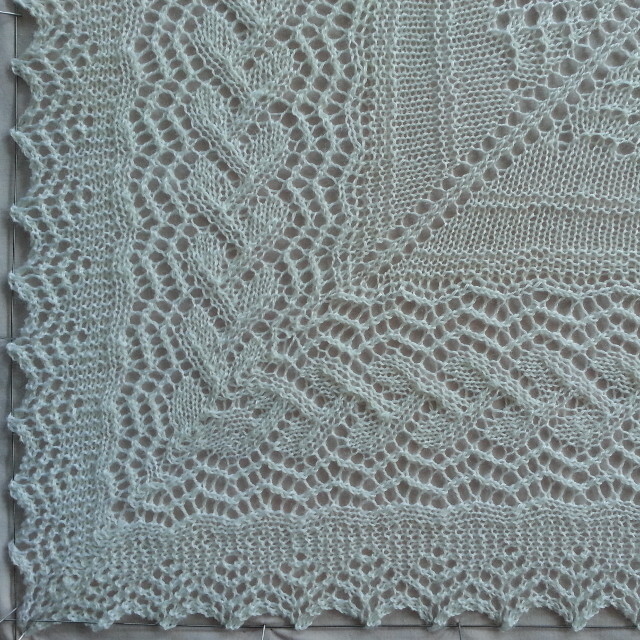 I chose favourite Shetland Lace patterns. Starting at the middle I did a bit of Stocking Stitch followed by a couple of two bands of holes. Then I did a number of full repeats of Feather (in the middle you need tiny pattern repeats for the pattern to show), Van Dyke and Rib, Snowdrop Lace and a 4‑hole/4‑decrease variation of Old Shale (Feather and Fan) bands, all separated by solid bands of Stocking Stitch with 3 rounds of Garter Stitch running through (approximately) the middle of them. It was approximately the middle because I sometimes had to adjust the number of rounds for those solid bands to get the stitch count I wanted so I could nicely centre the next lace pattern I wanted to do. I stopped when I thought it was about big enough (taking into account the width of my intended border) and I was a few stitches shy of the number of stitches on all sides that I needed for my border pattern's row repeats (bearing in mind that each stitch on the last round of the shawl represented two rows of the border pattern). I wanted it stitch-count perfect so when I got to the corners I finished on exactly the right row of the border repeat to start the mitre. To get the centre part of the shawl to that required stitch count I just did some more rounds of Garter Stitch. I made myself a chart to plan my lace patterns and it was very useful, particularly for making sure patterns were centred on each side of the shawl and for planning how I'd bring in the increased stitches at the corners so they integrated well into my lace patterns bands. Tip - if you centre your lace panels you can do a smaller chart for each lace section by charting the right-hand part of the corner for the stitches that fall outside of the "full lace repeats", then chart in one full lace pattern repeat and then chart in the left-hand part of the next corner for its stitches that fall outside the full repeats. Very often you'll notice that after a few lines in the chart the "corner sequence" to bring in the increased stitches repeats itself. Once you have that don't chart the rest of that lacy band, just keep repeating your abbreviated chart until your band is the size you want.